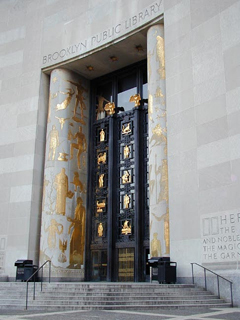 Scrolling through a list of New York City public buildings that are being propelled into the 21st century with energy audits and efficiency makeovers, I found the monumental art deco Brooklyn Central Library on Grand Army Plaza. As a high school student, I spent many Saturdays there combing through the stacks looking for materials on historical subjects and I vividly recall finding Civil War era documents that crumbled to dust as I turned the pages. Even as a teenager, I felt queasy about having the historical record simply vanish in my hands. Surely, there must be a better way to make this material available, even to the youngest researcher, without losing it by using it! While I trust that library standard operating procedures and technologies now keep such irreplaceable materials both secure and accessible, I was thrilled to see that today this art deco, free-to-all repository of historical ideas and information is able to make a new contribution to the 21st century because it's ready for its energy-efficiency make-over. An audit completed in 2010 examined energy use in four main areas of this 350,000 square foot municipal gem. If all the energy conservation and retro-commissioning recommendations made in the audit are adopted, the library could save $333,000 a year on its energy bills; that's a savings of 45%. Just think of all the books and magazines, whether paper or electronic, $333,000 could buy or preserve. According to New York City's first annual Energy Benchmarking Report, 2,730 government buildings have been studied and rated, using the EPA's Energy Star Portfolio Manager software. [i] By using a scale of 1–100, Portfolio Manager allows the comparison of energy performance in similar kinds of buildings. According to the report, "The City uses benchmark scores and other data to prioritize energy audits, retrofits, improved operations and maintenance, and retro-commissioning activities." Let's stand back from the details to consider the bigger Benchmarking picture. The City's Benchmarking Law — part of its "Greener Greater Building Plan" — offers the opportunity to collect and organize data that is useful for taking action and changing behavior when it comes to making energy-related decisions about real estate, an urban asset that can never move offshore. What kinds of decisions? Things like where you would prefer to live or work, rent or buy. Other things like determining the value of greener building renovations or training building operators to maximize the energy efficiency of the equipment on hand. And, I predict, decisions by banks and other financial institution about mortgages and loans. With comparative building benchmarking data on hand, it will be easy to see who's burning money and who's offering a better value. Of course, New York and other cities that benchmark are just learning the intricacies of how to do it right. First efforts can be replete with dirty, incomplete or inaccurate data. First efforts must grapple with software like the Energy Star Portfolio Manager, which never envisioned being mobilized to assess the array of building types and functions typical of big cities or the quirks of local electric metering practices. Looking ahead, the gold standard of next-generation benchmarking software and metrics should be to create models that are predictive, but we're not there yet. But today's baby-steps and challenges are only the beginning and New York City's first annual Benchmarking report is a great place to start. Soon, Benchmarking reports will include data coming from its larger commercial and then, larger residential buildings. New York City's Benchmarking law is the latest addition to the great American tradition of sunshine and right-to-know laws. In this tradition, the expectation of public access to building performance data and the ability to make efficiency comparisons among buildings are more powerful behavior changers than building inspectors' citations. Just like the promise of our libraries, there is so much to be learned. [i] To calculate ratings, Portfolio Manager uses information on electricity, natural gas, steam, and fuel oil consumption and adjusts for other factors, including building type, gross square footage, year of construction, weather, and operational data like operating hours and number of staff. Buildings that are not eligible for benchmarking scores still receive useful tracking information such as Energy Utilization Index (EUI), or energy use intensity, and GHG emissions figures. [ii] Just to be clear, benchmarking is a standardized way to take a "snapshot" in time of building energy use that make building-to-building and over-time comparisons possible. Auditing and retrofitting buildings are not yet standardized procedures and, as with retro-commissioning, are designed and carried out on a property-by-property basis.